Best Video Editing Software: If 15-18 years ago video editing was only for television professionals, cinematographers and video professionals, they were in industries where they depended on their processing, and today anyone can edit a video. Where's the difference? Producers of video editing software have thought that ordinary users and those working in various areas where you need video processing need the most useful and faster tools. Beyond the financial chapter, the producers have also exploited the modern user's appetite to have complete control of a video, to do what he wants with him and to have the best form of personal or professional filming. Editing videos is simple today, many popular programs have intuitive interfaces, are free variants and expensive product variants, each can choose what they want, depending on the budget. In the same video editor, you can edit audio, even collages of photos can be made with the kind of transitions that impress even the most demanding viewer. If you've been thinking of using a video editing program or want to replace the old program with a modern one that is well suited to your needs, you'll find below a top 3 video editing programs that are worth using and with exceptional results at the end of processing. ONE // Adobe Premiere Element, Adobe Premiere Pro CC. Here we have no way to analyze them differently, the programs resemble and offer similar functions to a point. The first Best Video Editing Software is for all types of users, it goes installed on Windows and Mac. What does it offer? Video stabilization, face detection, automatic motion detection, audio effects, filters, unlimited video tracks, and test mode. It can also be used by professionals, and by those who want to try something else. Easy to use and with many important features, Adobe Premiere Element is a bit heavy when you want to do a lot, but if you have a little patience and attention, everything goes smooth. Simplicity of editing, special editing effects, chroma-keying and opacity, media library intelligence organization, intelligent searches recommend Adobe Premiere Element. The Pro CC version of Adobe's Best Video Editing Software is suitable for Windows, but it also works on Mac. Multi-cam editing, 3D editing, unlimited video tracks, has and test time, is good for professionals, moves excellent. It has excellent automatic functions, it is very popular, it supports the import of video to be processed from any possible source, internal and external. Automatic synchronization when there are multiple "angled" scenes, a slightly easier to use interface, and faster input response, that's why it offers more than two versions of Adobe's Best Video Editing Software. It has excellent automatic functions, it is very popular, it supports the import of video to be processed from any possible source, internal and external. 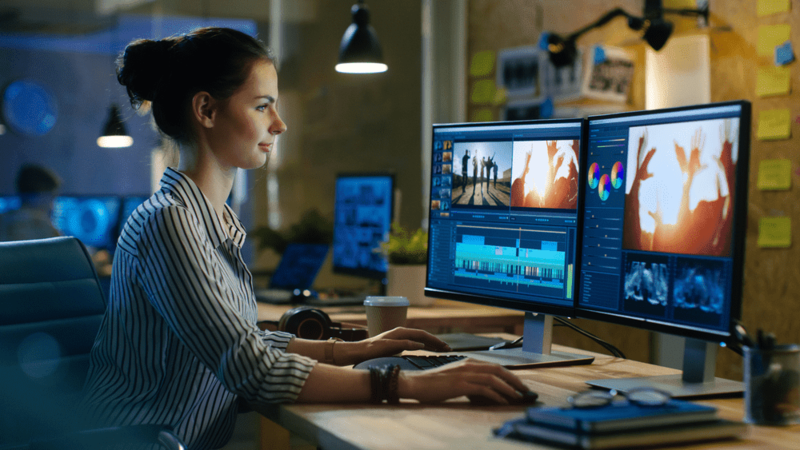 Automatic synchronization when there are multiple "angled" scenes, an easier-to-use interface, and faster input response, that's why it offers more than two versions of Adobe's Best Video Editing Software. It has excellent automatic functions, it is very popular, it supports the import of video to be processed from any possible source, internal and external. Automatic synchronization when there are multiple "angled" scenes, a slightly easier to use interface, and faster input response, that's why it offers more than two versions of Adobe's editing software. The two motion Best Video Editing Software comes from CyberLink, it's for those working in the active video, cinema, television industry, but an experienced user can use it very well. It installs only on Windows, is easy to configure and use. What does it offer? Multi-cam editing, 360 video editing, automatic motion detection, has a 30-day trial, is useful to beginners because it's clearer at interface level, easier to understand. In timeline you can have up to 100 videos, you have a lot of correction and stabilization tools, professional effects to apply when you want, you can quickly cut video and audio directly into the program without the need for other software. The program supports almost all possible file types, input response is particularly good, uses TrueVelocity technology for fast video editing and processing. All edited videos can be uploaded quickly to social networks. THREE // Final Cut Pro. Those who have a Mac, the Apple laptop, have Final Cut Pro, the most powerful editing program from Apple and with a very easy to understand and usable interface. What does it offer? Multi-cam editing, color intelligence balancing, unlimited video tracks, 30-day trial, easy to use interface and professional, and amateur. It can add and edit any audio file in a few steps, grouping tools and special effects, customizable, all add to the features of the video editing program. Final Cut Pro can sync with Photos and iTunes, it also provides powerful media organization, keying tools, broadcast-quality support, improved XML features, improved workflow, Chroma keying tools much better than other similar Best Video Editing Software. Support is very good, importing and exporting files is very fast, all popular formats are supported. Functions are enough to be able to process anyway you want a filmed video on vacation or to mount an interesting news story. Finally, we must mention two Best Video Editing Software programs that can be taken into consideration if the three options presented do not match you. One is for Android, because it's a lot to edit on the phone, tablet, it's KineMaster, which offers Instant preview, smart effects, multi-layer editing, text and handwriting, frame-editing, sub-frame, powerful audio editing. The second is Corel VideoStudio, just for beginners, with real-time effects, automatic color correction, intuitive interface specially designed for beginners in video editing. It has many-cam editing, 4K support, 360-degree VR support, music library and all kinds of effects.